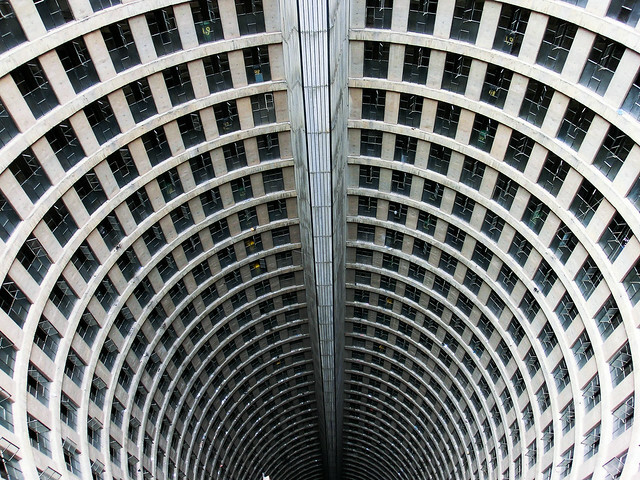 Ponte Tower in Johannesburg. Photo credit: Spach Los on Flickr. In In this Building, students of City Planning were asked to tell the story of a place – of a physical structure – through a medium of their choice. With the guidance of planning educators and journalism professionals, each student (myself included) was asked to select a building and tell its story. As we were to find out over the courses of our work, the draw of a building’s story could be visual or oral, centered around its storied past, or its future prospects. As students of “Planning” at MIT – that is, to skip Planning 101 for those outside the university, as students with varied interpretations of their own field’s past, present, and future – the selection processes of subjects were diverse. Buildings (or were they already stories?) were chosen for their standout physical traits, their distinct communities within, their ties with students in the class. The projects that emerged were unified by the prompt, but each unerringly individual. Philip Bloom’s film “Ponte Tower” is, to an extent, an example of the same effort: a portrait of a structure. But (for example) where my own project was about cooperation, idealism, and youth as much as a decades-old housing arrangement, Bloom’s film profiles a building that stands out architecturally, and stands in for a microcosm of racial, historical, and economic realities in Johannesburg and in South Africa as a whole. Bloom is a cinematographer – a peculiar type of storyteller concerned with image above all else. His work, including “Ponte Tower,” is simultaneously a story of place and a set of tests for the particular model of camera he is, in effect, selling with it. The comments on vimeo are more often about the specs of his camera than they are about this building, inhabited by hundreds. The place is looks cinematic. This fact explains a number of commenters’ describing it in comparison not to their own homes, but to hellish, apocalyptic visions dreamed up by other filmmakers. But then I’ve learned something I believe is real about this building, been told opinions and facts by its own residents, and this is all despite the fact that I’ll likely never enter the place. Thanks to this small piece of filmmaking, though, I have a sense of some of the stories contained within, and thanks to Bloom’s particular skills, I have a powerful sense of the image of the place. That communication of image is powerful, and it’s important. While image is only one of a huge number of factors that are involved in building and reading a place, and perhaps a less influential one than law, or culture, or economic forces, planners have a responsibility to recognize the role it plays. Here at MIT, the production of media has been integrated at least since Kevin Lynch’s “Image of the City,” a landmark book that was a photographic work, as well as the better-known mapping and writing components. As “Ponte Tower” demonstrates, students of planning have a great deal to learn from filmmakers, and as the outputs of “In this Building” demonstrate, those same students have the tools and capabilities to communicate and broadcast their own visions of place and encapsulations of story. With the ongoing proliferation of affordable, professional-grade tools for producing and distributing media, schools of planning and design – like MIT – have a crucial opportunity to support the integration of media literacy into their shared mission of understanding and impacting places and cities.